An Alabama Army National Guardsman was killed in a crash on I-65 Thursday morning when the military Humvee he was driving left the roadway and overturned on I-65 about six miles north of the Atmore exit. 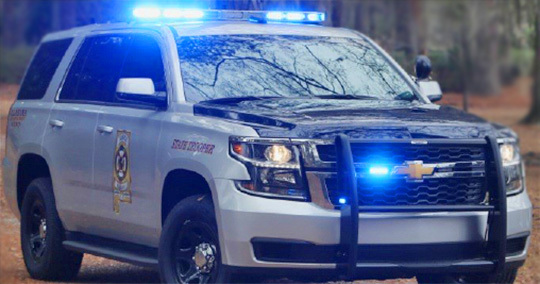 John Wesley Waldrop, 38, of Satsuma, AL, was pronounced deceased at the scene. A passenger in the vehicle, 25-year old Justin Cecil McCollough of Grand Bay, was transported to D.W. McMillan Hospital in Brewton. Both were members of the 1156th Military Police. Waldrop was a graduate of Escambia County High School in Atmore. Alabama State Troopers are continuing their investigation. 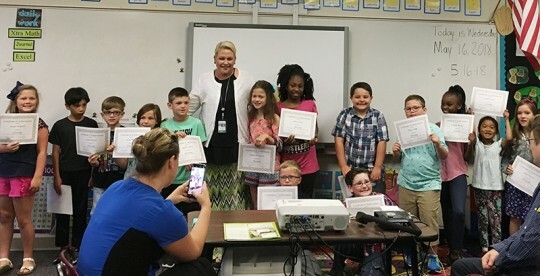 The home of The Incredible Egg, the American Egg Board, has named Naudia Carach of Bratt as the winner of the national “You’re Incredible Because…” contest. The Incredible Egg will present Naudia with a $2,500 check and present Northview High School with a $2,500 donation. She will also receive an Incredible Egg-themed prize pack and will be featured on the Incredible Egg website and social media channels. Naudia will be a sophomore at Northview High School this fall. 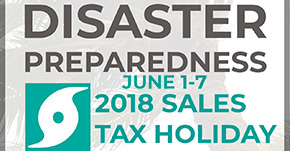 The 2018 Disaster Preparedness Sales Tax Holiday was passed by the Florida Legislature and signed into law by Governor Rick Scott. This sales tax holiday continues through Thursday, June 7. During this sales tax holiday period, qualifying items related to disaster preparedness are exempt from sales tax. Any gas or diesel fuel container, including LP gas and kerosene containers. Portable generators used to provide light or communications, or to preserve food in the event of a power outage. Thursday: A 30 percent chance of showers and thunderstorms, mainly after 1pm. Partly sunny, with a high near 90. Light south wind increasing to 5 to 10 mph in the morning. Thursday Night: Partly cloudy, with a low around 72. South wind around 5 mph becoming calm after midnight. Friday: A 30 percent chance of showers and thunderstorms. Mostly sunny, with a high near 90. Light southwest wind increasing to 5 to 10 mph in the morning. Friday Night: A 20 percent chance of showers and thunderstorms. Partly cloudy, with a low around 74. Southwest wind around 5 mph. Saturday: A 50 percent chance of showers and thunderstorms. Mostly sunny, with a high near 94. West wind 5 to 10 mph. Saturday Night: A 20 percent chance of showers and thunderstorms. Partly cloudy, with a low around 74. Southwest wind 5 to 10 mph. Sunday: A 50 percent chance of showers and thunderstorms. Partly sunny, with a high near 94. West wind 5 to 10 mph. Sunday Night: A 40 percent chance of showers and thunderstorms. Mostly cloudy, with a low around 71. Northwest wind 5 to 10 mph. Monday: A 40 percent chance of showers and thunderstorms. Mostly sunny, with a high near 93. Monday Night: A 20 percent chance of showers and thunderstorms. Partly cloudy, with a low around 70. Tuesday Night: A 20 percent chance of showers and thunderstorms. Partly cloudy, with a low around 70. Wednesday: A 20 percent chance of showers and thunderstorms. Mostly sunny, with a high near 92. 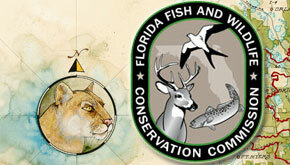 Contact Paul Averill, Florida Fish and Wildlife hunter safety instructor at (850) 982-8070m or visit MyFWC.com/HunterSafety for more information. Pictured: Award winners from Mrs Daniels’ second grade class at Molino Park Elementary. Photos for NorthEscambia.com, click to enlarge. The Blue Wahoos rallied for three runs in the eighth inning to snap their three-game losing streak with a 6-4 win Wednesday night at the Baseball Grounds of Jacksonville. The Blue Wahoos tied the game at 3-3 on an error in the seventh. Alberti Chavez led off with a pinch-hit single and scored from second on a routine ground ball past the Jumbo Shrimp third baseman. In the eighth, the Blue Wahoos got singles from Luis Gonzalez, Daniel Sweet and Taylor Sparks to kick start the rally. Gonzalez went first to third on Sweet’s hit, then scored on an errant throw back to the infield from Cade Gotta in left field. Sweet scored on Sparks’s single, and Sparks came home on a wild pitch to make it 6-3 Blue Wahoos. Kyle Keller (L, 1-2) surrendered all the damage and suffered the loss for the Jumbo Shrimp. The Shrimp got a solo home run from former Wahoo Eric Jagielo off Alejandro Chacin in the eighth, but that’s as close as they got. Each team belted two homers in the game, all four were solo shots. Despite suffering control problems on the mound, Keury Mella put the Blue Wahoos ahead with a solo homer in the third. C.J. McElroy hit his second of the season leading off the fifth. Mella didn’t factor a decision after allowing three runs on just two hits over four innings. He fought his control all game with a season-high seven walks with six strikeouts. Kevin Canelon (W, 1-0) picked up the win. He joined the team before the game from high-a Daytona and worked a scoreless seventh inning. Alex Powers (S, 4) shut the Shrimp down in order in the ninth for the save. The series continues with the middle game of five on Thursday night. The Blue Wahoos will turn to LHP Seth Varner (2-0, 3.33) for his second start against RHP Robert Dugger (0-0, 5.40). 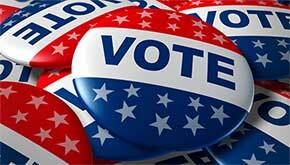 Florida submitted paperwork Wednesday to draw down $19.2 million in federal funding to beef up elections cybersecurity. The Florida Department of State announced the required documents had been sent to the U.S. Election Assistance Commission, a week after Gov. Rick Scott directed the action. “Once the department receives the funding, we will work with the Florida Legislature to provide funding to supervisors of elections as well as bolster state efforts to enhance cybersecurity and voting practices prior to November’s elections,” department spokeswoman Sarah Revell said in a prepared statement. Earlier in the day, U.S. Sen. Marco Rubio, R-Fla., who has repeatedly warned of a “level of overconfidence” about the security of the nation’s election system heading into the 2018 elections, met with some county supervisors to discuss security. “While I have confidence in the competence and commitment of Florida’s election officials, cyber threats sponsored by a nation state are sophisticated and constantly evolving,”Rubio said in a statement. Rubio added he intends to push federal officials to share more information with Florida and other states regarding Russian-sponsored attacks during the 2016 elections. A day before Scott’s directive on seeking the federal money, Secretary of State Ken Detzner had told reporters that counties shouldn’t expect the money before this year’s elections, as the Legislature — which has already held its 60-day regular session — must approve the spending. A group of Democratic U.S. House members from Florida had also implored Detzner to apply for the federal money, which is available to Florida as part of $380 million included in a federal spending bill to help states secure election systems. Florida lawmakers have included $1.9 million in the state’s $88.7 billion budget for next fiscal year to establish a network-monitoring security program for the Division of Elections that provides automated alerts about threats, allowing county election officials to respond when data may be at risk. The Legislature did not provide funding to fulfill the department’s request for five additional full-time employees to serve in cybersecurity positions. Earlier this month, Scott directed Detzner to hire five cybersecurity specialists to work as consultants with county elections officials. Susan Fillingim Purvis, age 70, passed peacefully May 30, 2018, after enduring a short illness and a 41-year battle with rheumatoid arthritis. Born in Atmore, AL, she grew up in the Bay Springs, FL, community where her family owned and operated Morris’ General Store. Susan married Gary Purvis on June 19, 1964, and together they own and operate Sugarfoot Farms in Northwest Florida. She loved nothing more than spending time with her family and friends and entertaining them in the home she and Gary built together. No one was a stranger in her home, everyone was always welcome. Susan attended Ernest Ward High School and Pensacola Junior College. When she wasn’t home taking care of the household she was out on the family farm. Mrs. Purvis was preceded in death by her parents Robert T. “Tommie” and Gail Morris Fillingim. She is a survived by her husband of 54 years Gary R. Purvis; a son Gary Wayne Purvis (Monica) of Blountstown, FL, and a daughter Sharon Delmar (Mark) of Atmore, AL; three grandsons, Nick Delmar of Pensacola, FL, Brandon Purvis, and Colton Purvis both of Blountstown, FL; mother-in-law Bernice Purvis of Bratt, FL; brother-in-law Mike Purvis (Cathy) of Blountstown, FL; nephew Brad Purvis (Nicole) and niece Ashley Purvis all of Blountstown, FL; and many special family and friends. Pallbearers are Nick Delmar, Rodney Fillingim, Wayne Fillingim, Brad Purvis, Brandon Purvis and Colton Purvis. Honorary pallbearers are Lloyd Albritton, Billy Bryan, Wendell Hall, Wendell Rigby, Merrill Traylor and Billy Ray Williams. 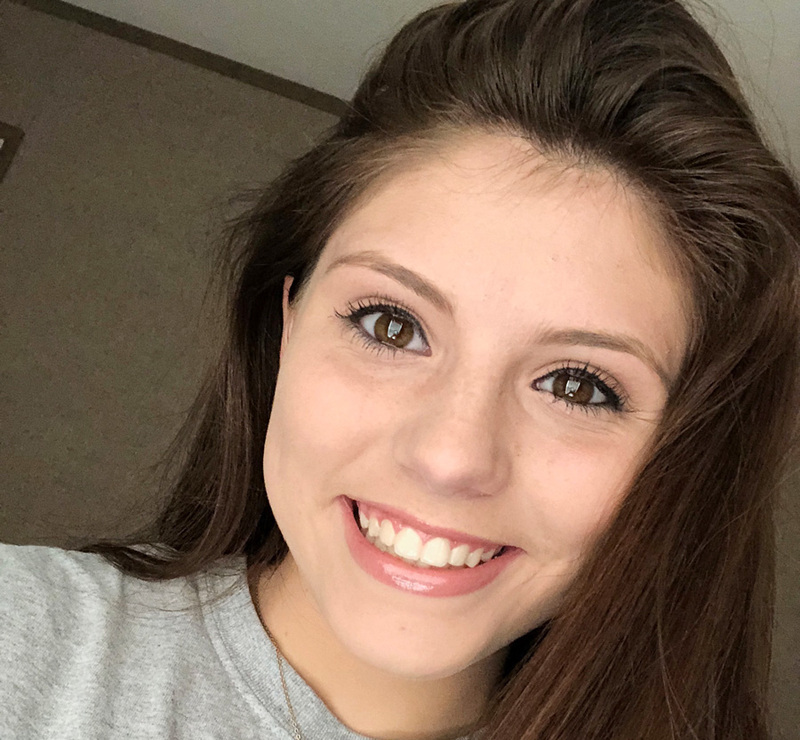 Visitation will be held this Friday, June 1, 2018, from 6 p.m. until 8 p.m. at Johnson-Quimby Funeral Home, Atmore, AL. 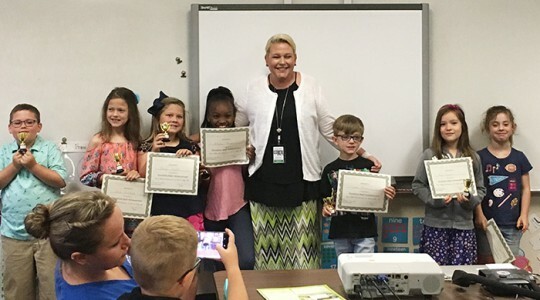 A celebration of life will be held Saturday, June 2, 2018, at 2 p.m. at the First United Methodist Church, Atmore, AL, and will be officiated by Rev. Brennan Peacock. Internment will follow at Enon Baptist Church in Enon, FL. A Molino man was arrested Sunday after failing to stop for an Escambia County deputy. A deputy attempted to conduct a traffic stop near Oakfield on a vehicle driven by 28-year old Dwayne Tyson Kennedy. Kennedy continued to drive north to a Circle K at Highway 29 and Kenmore Road, drove through the gas pumps and continued around the building and back out to Highway 29, according to an Escambia County Sheriff’s Office report. The deputy turned off his emergency lights and did not pursue the vehicle. When the deputy turned around, he saw the vehicle had returned to the parking lot, and he conducted a traffic stop. The deputy reported the smell of marijuana coming from the vehicle when Kennedy rolled down his window, the report states, and deputies recovered a digital scale and a marijuana blunt. They reported finding $515 in cash on Kennedy’s person, along with what was described as a written log of drug transactions. Kennedy was charged with felony fleeing and eluding, possession of marijuana, possession of drug paraphernalia and driving with a suspended license. He was also cited for a window tint violation. 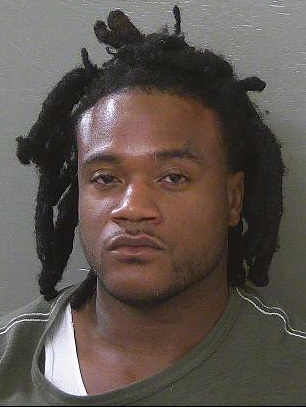 Kennedy was released from the Escambia County Jail on an $8,000 bond. Deputies also located a loaded .9mm Luger in the parking lot behind the gas station immediately after the pursuit; however, Kennedy was not immediately charged with any weapons offense. Kennedy’s Dodge Charger and the cash were seized, and the weapon was taken into evidence.